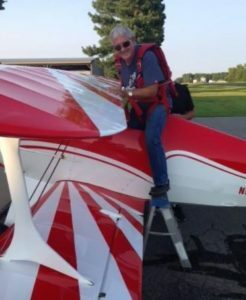 Congratulations to Harvey Swift (lot Homestead) and his Pitts S-1C for earning the Paul Poberezny Founder’s Award for Best Classic Homebuilt Award at EAA Airventure 2017. The plans built bi-plane was a six-year project for Harvey, a retired Southwest airlines pilot and aviator with 40 years behind the stick. If you see Harvey riding around the airpark on one of his classic motorcycles, flag him down! He’ll be happy to show you his award-winning baby! 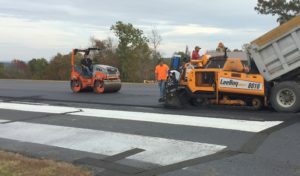 In a continuing effort to maintain and improve the roads and taxiways of the airpark, new asphalt was installed from the postal center to the bottom of Flag Hill. Prior to the overlay, French drains and gravel were installed to help direct ground water under and away from the asphalt surface. In addition, seal coating was applied to the Southridge Road entryway from Holley Mountain Road to the postal center. 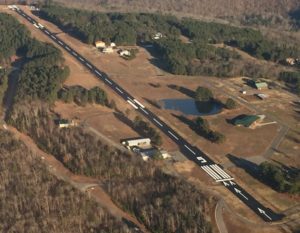 Bids and plans for additional pavement management are in the works for 2018. 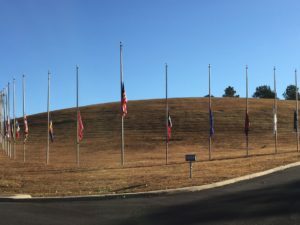 With a heavy heart, the flags on Flag Hill have once again this year been lowered to half-mast in remembrance of the victims of the mass shooting in Texas. The flags will soon be coming down for the winter season when they will be cleaned, repaired and stored for the winter by volunteers Carol Oakland (lot 5/6 ) and Joan Bland (lot 87 ). You’ll know spring is really here with the flags are hoisted once again in April. at Cantrell Field (KCWS) in Conway Sunday afternoon, November 5th. Just a quick note to remind all of the upcoming meeting. 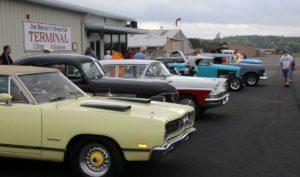 It looks like we will have a good turnout, and the Oaklands are graciously supplying their beautiful hangar again. 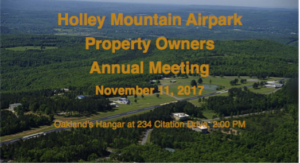 We hope you all can attend…even looks like it might be a good flying day. If you do fly in, call Beth, and someone will come get you. Important reminder: If you are unable to attend, please email me your proxy naming the person you’d like to vote on your behalf, or you can designate the Board as your proxy. 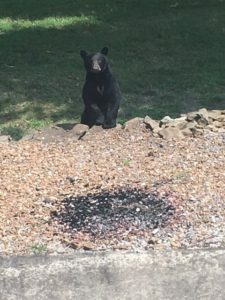 I spotted a 300+Lb black bear crossing Holley Mountain Rd this morning about 300 yds south of the Hilyer’s headed east. Might notify the residents to mind their trash and pets for a few days. 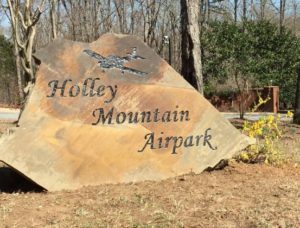 Many, many thanks to the generosity of an anonymous donor for our new entryway rock, proudly on display to the passersby on Holley Mountain Road. The rock was purchased at Stevens Stone Supply on Highway 65 North and crafted by Amy Ragland of “Ragland Custom Hand Engraved Stone”. 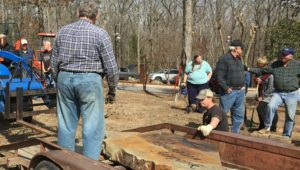 The slab was set in place at the airpark entrance by a horde of eager airpark volunteers on Saturday, March 4th. The HMA Landscaping Crew has added a solar-powered night light and is planning to install a planting bed in the near future to further accentuate the slab. Runway 05/23 has never looked better! Crews from Asphalt Pavers Inc. of Conway delivered 3,200 tons of asphalt in 160 dump truck loads. 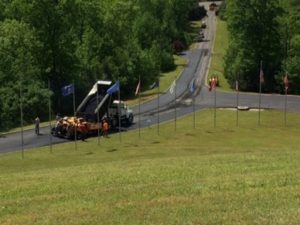 They installed 9,500 linear feet of 12” wide bituminous crack sealing tape over the existing cracks before laying 270,000 square feet of pavement. After the 2-inch asphalt resurfacing, 200 gallons of paint were applied to bring the runway to life. More good news – the final bill was actually a few dollars under the estimate! 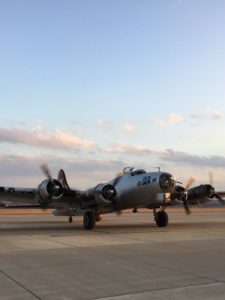 Thanks to Mike Foote (lot 10/11) for coordinating the massive undertaking, along with Harold Sindt (lot 40), Milton Bland (lot 87), and all the volunteers who helped in the project. 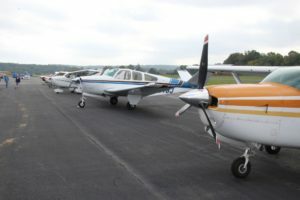 EAA members did their best, but Mother Nature had other plans for the annual Clinton Airport Fly In/Open House. .
Fog followed by low ceilings limited the ‘fly in’ portion of the show, but folks still enjoyed the ‘open house’. Dawson Aircraft emptied their hangars and Dr. Don Warren’s King Air, based at KCCA, added to the static display to make it look like we had a fly in. Once the clouds did finally part, onlookers enjoyed a pumpkin bombing demonstration. 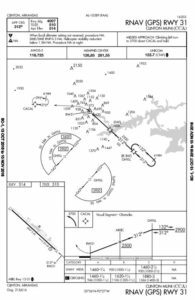 The new approach went ‘live’ in July and, with an MDA of 1460 feet, could provide an option to Little Rock/N Little Rock for times when finding our home runway isn’t possible. This link will take you to a larger, easier to read version of the approach plate.